This Ruland setscrew shaft collar is made of aluminum. It is a setscrew-type shaft collar for applications supporting low axial loads and simple positioning. Setscrew collars have improved holding power when the shaft material is softer than the setscrew material. It is made of aluminum for resistance to corrosion and tarnishing and is lightweight for use in applications where material weight is a consideration. This collar comes with a forged setscrew for securing the collar onto the shaft. The operating temperatures for this collar range from -40 to 107 degrees C (-40 to 225 degrees F). 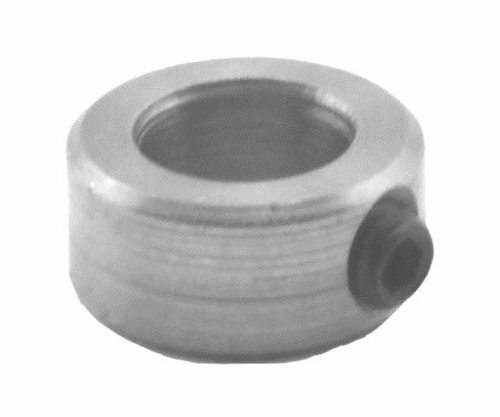 This shaft collar is suitable for use in various applications, including in the automotive industry to situate components in automobile power steering assemblies, the manufacturing industry to locate components on a conveyor belt system, and the hobby craft industry to hold wheels on axles in remote control vehicles, among others. Ruland manufactures shaft collars, rigid couplings, and zero-backlash motion control couplings including beam couplings, bellows couplings, Oldham couplings, curved jaw couplings, and miniature disc couplings. The company, founded in 1937, and headquartered in Marlborough, MA, complies with Restriction of Hazardous Substances (RoHS) and Registration, Evaluation, Authorization, and Restriction of Chemicals (REACH) standards. Package Content : 4-Pieces 3/4 Zinc Plated Shaft Collars with 1Pcs Set Screw. 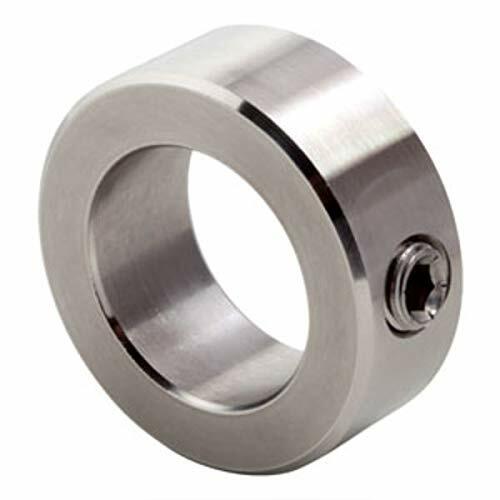 This Climax Metal setscrew shaft collar is made of stainless steel 303. It is a setscrew-type shaft collar for applications supporting low axial loads and simple positioning. Setscrew collars have improved holding power when the shaft material is softer than the setscrew material. It is made of stainless steel 303 for greater resistance to corrosion than steel or aluminum. This collar comes with a socket setscrew for securing the collar onto the shaft. 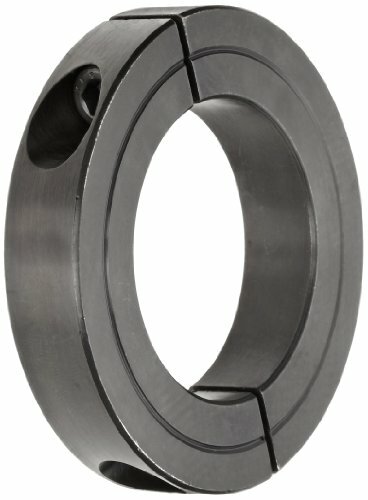 The operating temperatures for this collar range from -40 to 426 degrees C (-40 to 800 degrees F).This shaft collar is suitable for use in various applications, including in the automotive industry to situate components in automobile power steering assemblies, the manufacturing industry to locate components on a conveyor belt system, and the hobby craft industry to hold wheels on axles in remote control vehicles, among others. 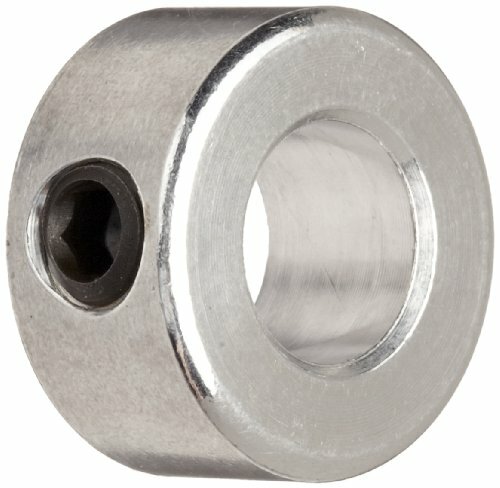 This Climax Metal setscrew shaft collar has a lightweight design and is made of zinc-plated steel. It is a setscrew-type shaft collar for applications supporting low axial loads and simple positioning. Setscrew collars have improved holding power when the shaft material is softer than the setscrew material. This collar has a lightweight design for applications that have limited space. It is made of steel for weldability and rust resistance and is zinc plated for better resistance to corrosion than black oxide steel. This collar comes with a socket setscrew for securing the collar onto the shaft. The operating temperatures for this collar range from -17 to 121 degrees C (0 to 250 degrees F). 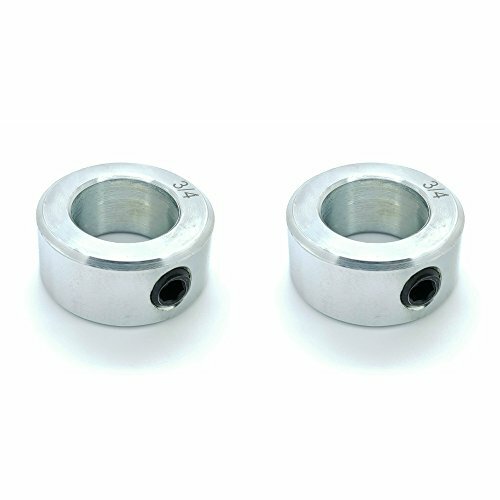 This shaft collar is suitable for use in various applications, including in the automotive industry to situate components in automobile power steering assemblies, the manufacturing industry to locate components on a conveyor belt system, and the hobby craft industry to hold wheels on axles in remote control vehicles, among others. 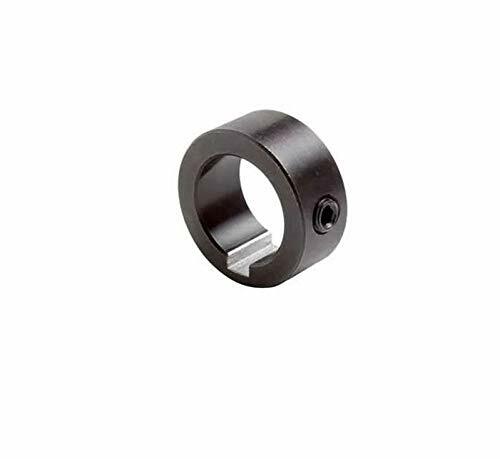 This Climax Metal setscrew shaft collar has a keyway and is made of black oxide steel. It is a setscrew-type shaft collar for applications supporting low axial loads and simple positioning. Setscrew collars have improved holding power when the shaft material is softer than the setscrew material. This collar has a keyway for use on keyed shafts. It is made of steel for weldability and rust resistance with a black oxide finish for a decorative appearance and resistance to white corrosion, chipping and flaking, and stick-slip of the screw during torqueing, improving the collar's grip on the shaft. Black oxide also provides mild corrosion resistance and improved lubricity. This collar comes with a socket setscrew for securing the collar onto the shaft. The operating temperatures for this collar range from -17 to 148 degrees C (0 to 300 degrees F). 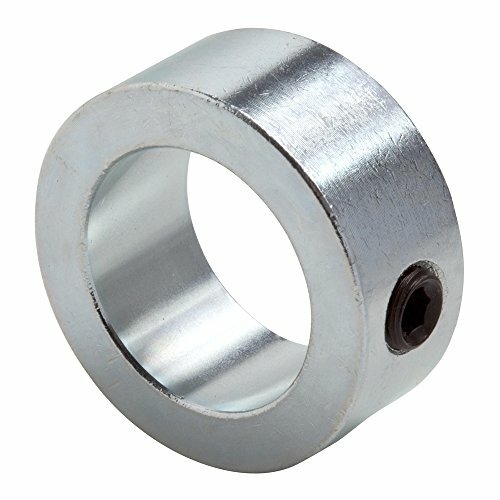 This shaft collar is suitable for use in various applications, including in the automotive industry to situate components in automobile power steering assemblies, the manufacturing industry to locate components on a conveyor belt system, and the hobby craft industry to hold wheels on axles in remote control vehicles, among others. 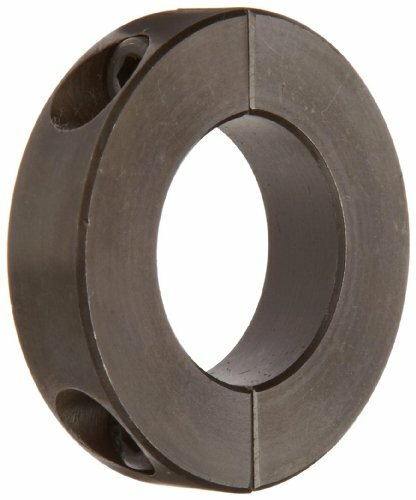 This Climax Metal two-piece clamping shaft collar has a recessed screw head and is made of black oxide steel. It is a two-piece clamping shaft collar for applications requiring a stronger holding power and higher axial load capacity than setscrew or one-piece clamping collars. The two-piece design separates into two halves, allowing installation or repositioning anywhere on the shaft without disturbing existing components. It accommodates a greater variety of shaft diameters than setscrew collars and is effective on both hard and soft shafts. 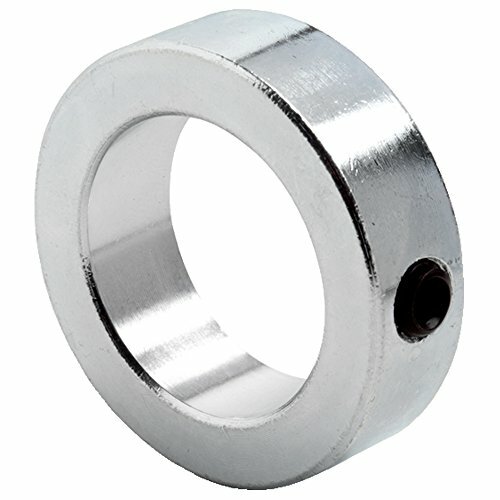 This collar has a recessed screw head that provides an exterior profile free of major projections for increased safety. It is made of steel for weldability and rust resistance with a black oxide finish for a decorative appearance and resistance to white corrosion, chipping and flaking, and stick-slip of the screw during torqueing, improving the collar's grip on the shaft. Black oxide also provides mild corrosion resistance and improved lubricity. This collar comes with socket-head cap screws for securing the collar onto the shaft. The operating temperatures for this collar range from -17 to 148 degrees C (0 to 300 degrees F). This shaft collar is suitable for use in various applications, including in the automotive industry to situate components in automobile power steering assemblies, the manufacturing industry to locate components on a conveyor belt system, and the hobby craft industry to hold wheels on axles in remote control vehicles, among others. 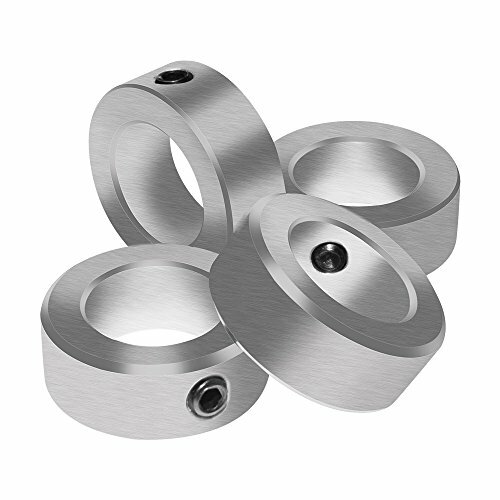 This set screw shaft collar is made of solid 304 stainless steel, The setscrew-type shaft collar has improved holding power when the shaft material is softer than the setscrew material which supporting low axial loads and simple positioning. Good axial and radial support performance. 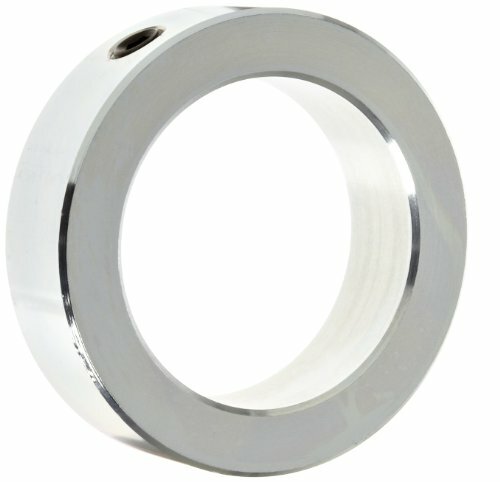 This shaft collar Comes with a socket cup-point setscrew for securing the collar onto the shaft. Suitable for nearly all types of machinery and industry, such as drive shafts, agricultural implements, medical equipment, gearbox assemblies, motor bases, machine tools, and paper and steel mill equipment, the automotive industry, the manufacturing industry, the hobby craft industry. Bore Diameter: 5/8, Outside Diameter: 1-1/8, Height: 1/2. Suitable for gearbox assemblies, motor bases, machine tools, drive shafts, agricultural implements, medical equipment, and paper and steel mill equipment, the automotive industry, the manufacturing industry, the hobby craft industry and many more. 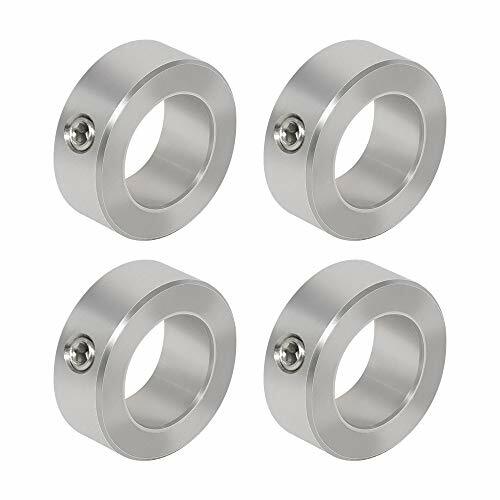 Package Content: 4-Pieces 5/8 Stainless Steel Shaft Collars with 1Pcs Set Screw. Our two piece clamp-on shaft collars are similar to the one-piece collars as far as how they work. Two piece clamp on collars come apart in two halves for easy installation and maintenance. Recessed screw head provides an outside surface free of major projection for safety. Design fully engages the shaft without marring. They clamp evenly around the shaft therefore providing excellent holding power. Made of carbon steel with a Black-Oxide finish to offer mild corrosion resistance. 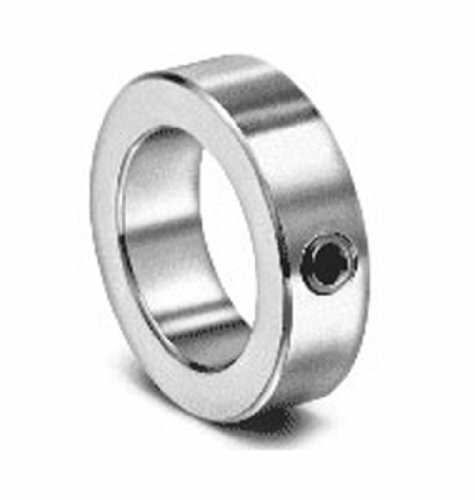 Our shaft collars are available in several different styles to meet you or your customer s needs. Climax Metal Products Co. in business for over 60 years is the leading manufacturer of shaft collars, rigid couplings & keyless locking assemblies. Climax Metals, where fair market pricing and excellent customer service is our promise to you. Simply slide these collars onto a shaft and tighten the set screw to hold the collar in place. Collars are easy to adjust with their set screws. Made of carbon steel with a Black-Oxide finish to offer mild corrosion resistance. Our shaft collars are available in several different styles to meet you or your customer s needs. Climax Metal Products Co. in business for over 60 years is the leading manufacturer of shaft collars, rigid couplings & keyless locking assemblies. Climax Metals, where fair market pricing and excellent customer service is our promise to you. Martyr Anodes provide low cost marine cathodic protection for boats, marine structures and boat equipment. Often called "Boat Zincs , Martyr Anodes are made of a specialized alloy based on the US Mil Spec using only High Purity metals. Martyr is the only manufacturer that offers all three alloys that protect your boat from corrosion that can occur in salt water, brackish water and fresh water. Martyr anodes are pressure diecast and manufactured to strict quality standards through an ISO 9001 Quality Management system and are guaranteed to be manufactured to US Military Alloy Specifications. Martyr manufactures sacrificial zinc anodes, aluminum anodes, and magnesium anodes, all of which are proven to prevent boat corrosion that leads to pitting to the hull plate, rudders, and bilge keels. Martyr anodes also protect propellers, shafts, shaft brackets, stern tubes, engines and rudders. Martyr provides anode kits that include all installation hardware and instructions. For more information visit www.martyranodes.com. Depth Collars & Sets. Designed for use with drills and counter bores. Features collars with set screws which lock into the drill flute or bit surface. Simply slide these collars onto a shaft and tighten the set screw to hold the collar in place. Collars are easy to adjust with their set screws. Made of T303 stainless steel which provides excellent corrosion resistance. 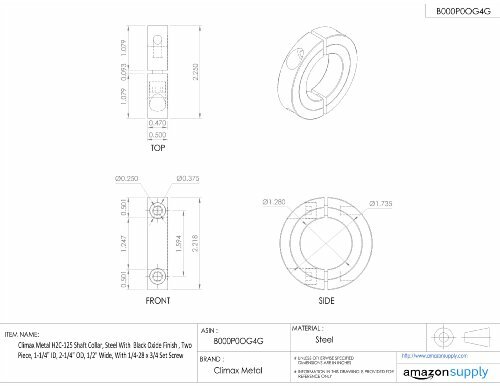 Our shaft collars are available in several different styles to meet you or your customer s needs. Climax Metal Products Co. in business for over 60 years is the leading manufacturer of shaft collars, rigid couplings & keyless locking assemblies. Climax Metals, where fair market pricing and excellent customer service is our promise to you. Shaft Collars are easy to adjust with their set screws. They are easy to install without having to disassemble machinery or components. Shaft collars create a tight fit and greater holding power, without the shaft damage caused by set screws. To install, simply slide these collars onto a shaft and tighten the set screw to hold the collar in place. 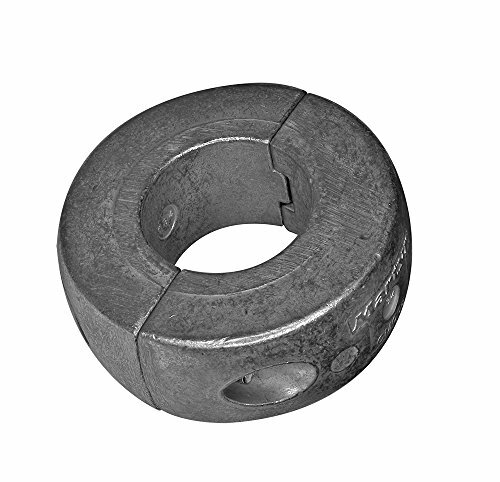 This Climax Metal setscrew shaft collar is made of zinc-plated steel. It is a setscrew-type shaft collar for applications supporting low axial loads and simple positioning. Setscrew collars have improved holding power when the shaft material is softer than the setscrew material. It is made of steel for weldability and rust resistance and is zinc plated for better resistance to corrosion than black oxide steel. This collar comes with a socket setscrew for securing the collar onto the shaft. The operating temperatures for this collar range from -17 to 121 degrees C (0 to 250 degrees F). 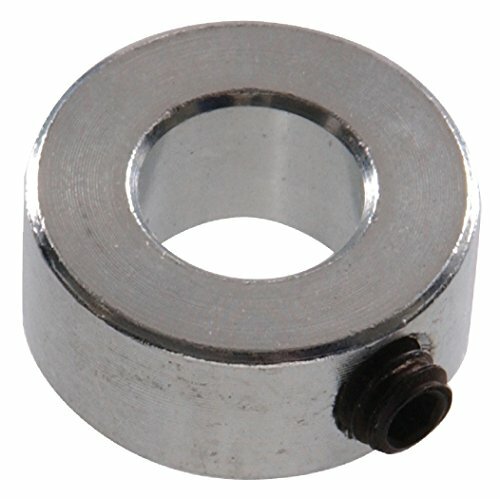 This shaft collar is suitable for use in various applications, including in the automotive industry to situate components in automobile power steering assemblies, the manufacturing industry to locate components on a conveyor belt system, and the hobby craft industry to hold wheels on axles in remote control vehicles, among others.